Broad beans are cool weather vegetables, grown in either the early spring or fall. Broad beans have been grown for thousands of years and are said to have been found in Egyptian tombs. Although they are commonly called fava beans, broad beans can go by different names in different countries. The broad bean known as either Windsor or straight bean (subspecies faba var. major) is the one most westerners know and grow. The tick or pigeon bean (subspecies faba var. minor ) is more popular in Arab countries and the horse bean (subspecies faba var. equina) is used as horse feed. Broad beans plants are large and leafy. They can reach anywhere from 2 – 5 feet tall. The square, hollow, stems are somewhat rigid and require minimal staking, although they will flop under the weight of the pods. Leaves The leaves are rounded and look more like pea leaves than beans. Flowers: The flowers grow in spiked clusters and are white with a black dot. They mature into thick, waxy-looking pods that grow from 2 – 12 inches long. Most commonly either broad bean or fava bean, but also English bean, field bean, horse bean, pigeon bean, tick bean and Windsor bean. Full sun to Partial Shade. Fava beans are a cool-season vegetable and really prefer full sun when grown in the spring. Fava beans are grown as an annual vegetable, so they do not have a USDA Hardiness Zones Hardiness Zone. Broad beans require a 75 – 80-day growing season, depending on the variety. However, in mild climates, they can be planted in the fall and allowed to grow slowly through the winter, for a spring harvest. Fall planted broad beans can take up to 240 days to mature. Pick the pods when they feel full. Since you'll be eating them fresh, don't wait until the pods start to dry. The older the pods get, the drier the beans will taste. If you harvest the pods while they are a little thinner than the average finger, you can cook them pod and all. After that, the pods get too tough to eat and they become shelling beans. Shelled beans can be used immediately, stored in the refrigerator for a couple of days, or frozen for later use. Cooked beans can get dried out in the refrigerator. Tossing them in a little oil will help keep them fresh. If you miss a harvest and your beans get a little too old and dry for fresh eating, you could still cook them and make a bean puree. The creamy, nuttiness of fava beans works well with brighter flavors like mint, onions and even dill. Salt also heightens their flavor, making them nice complements for sausages and good when combined with salty cheeses. Soil: Fava beans grow best in a soil with a neutral soil pH in the range of 6.2 to 6.8. They don't mind cool soil, but it shouldn't be waterlogged or soggy. Since cool soil inhibits the bacteria that help legumes fix their own nitrogen, using an inoculant or simply adding extra organic matter to the soil, will increase the nitrogen supply and make for healthier plants. 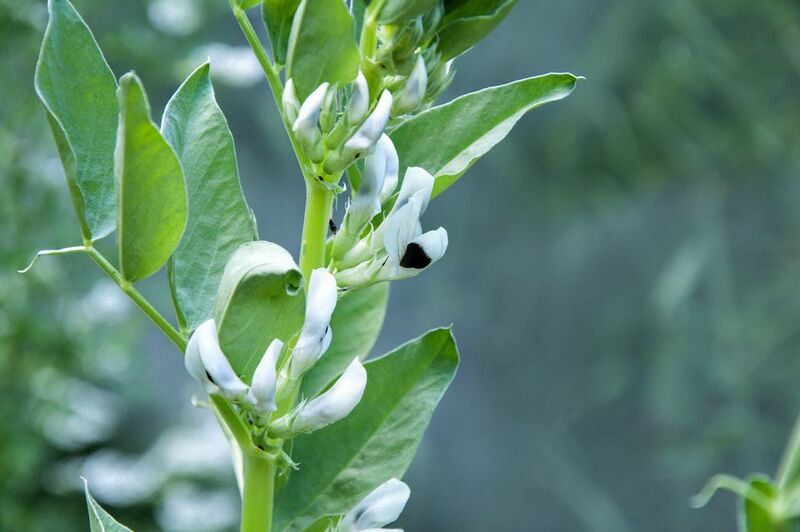 Planting: Fava beans need a long, cool growing season. They won't flower well in hot, dry weather. In mild climates, USDA Zones 6 and up, they are planted in the fall and grown through winter. The plants can handle some frost. Seeds usually germinate in 7 –14 days, but germination may be slower in cool soil. In colder zones, with snowy winters, they are planted in the spring, once the soil has dried out, usually sometime in April. You can start them indoors, in peat or paper pots, about 1 month earlier. Fava beans are planted much the same way you would grow other types of beans. You can speed up germination by soaking the seeds in water for an hour, before sowing. Direct sow the seeds about 2 inches deep, spaced 4 - 6 inches apart. Thin the seedlings to 8 – 12 inches, because crowding can encourage diseases. You could also grow them in hills, with 5 – 6 beans per hill, with hills spaced 4 feet apart. Taller varieties should be staked, while young. Even the shorter varieties can use a little support because the pods can become heavy. Many gardeners like to pinch out the growing tip or cut off the top stem and 2 sets of leaves, once the beans start forming on the lower portion of the plant. This gives you an earlier harvest and keeps the centers of the plants open to air flow and sunshine, which helps prevent fungus diseases and insect problems. Black flies will attack as the season warms. Broad bean seed beetles eat holes in the seed, but they can still germinate. Pea and bean weevil will feed on the leaves and can damage young seedlings. Mice and other rodents will eat the seeds. Fungal diseases and rust can be a problem, because of the cool conditions. Provide plenty of room between the plants. Because of the cool seasons, rotting can be a problem in damp soil. Too much frost or snow can damage the tissue. Use some type of row cover, for protection.